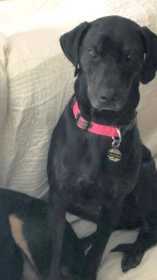 Lab hound mix (serious mutt). Very short hair, almost completely black except for a little brindling (brown and black mixed) around her jawline and a little on her legs. No white at all. 2 years old Fit and trim. Some purple on her tongue. DOES NOT LICK. Ever. Very sweet and snuggly. A little skittish. Bays, instead of barking. LOVES Pretzels and bacon flavored treats. Reacts to the sound of a pretzel bag. Sweetest dog on the planet. Deeply missed.